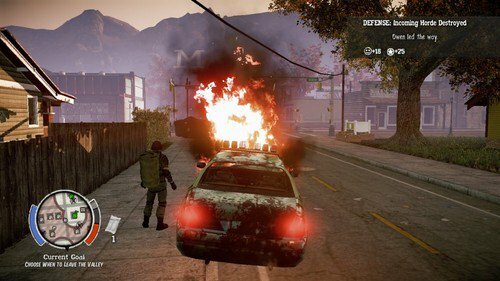 Undead Labs' first DLC for its zombie survival simulation game State of Decay is out now, and while it doesn't fix many of the problems that plague the base game, it does mix up the gameplay formula into something much more satisfying and addicting . Buildings and cars pop into existence, the framerate staggers on a regular basis, and the undead still sometimes clip through cars as you try to run them over, but the gameplay is more fun than ever thanks to one crucial subtraction: the story. State of Decay in its original form is a narrative-driven experience where the player controls a group of survivors, collecting resources and completing objectives in an effort to eventually escape the zombie-riddled county and beat the game. Breakdown strips that all away and lets players survive as best they can without a narrative tied in, letting the game shine for what it truly is. As players recruit more and more survivors, moving from safehouse to safehouse in an effort to survive, resources naturally get used up. Considering the game is a simulation, these precious items don't respawn, meaning once the world has been completely combed over, it's only a matter of time until your group of survivors starves to death, runs out of medicine, or gets overrun by the undead hordes. To combat this issue, Breakdown includes the ability for the player to fix up a broken down RV randomly placed in the map. After gathering the equipment necessary to get the vehicle running again, you choose a handful of your favorite survivors (including new unlockable Hero characters with specific maxed out stats) and "leave," thereby resetting the map and upping the difficulty. This is perfect for those who want to take their time on the lower levels just enjoying the survival simulation and those brave souls who want to reach ludicrous levels and unforgivable difficulties. I spent over 10 hours on the initial level alone, basically stripping the entire world of any salvageable gear and resources before moving on, but it's entirely possible to blaze through the first few levels in mere hours by fixing the RV as quickly as possible. Undead Labs has provided players with whole new choices as to how they play, giving this DLC greater value than the original game itself. When playing State of Decay in the summer, I felt a constant itch to halt the story's progression and simply enjoy the zombie survival without what I felt to be an unnecessary and boring story chugging the game along. However, knowing that I'd run out of materials and back myself into a corner if I dwindled too long, I kept pushing forward, eventually ending the narrative only to (disappointingly) see there was no "endless mode" post-credits. Breakdown is what I wish the original game was (or at least offered after completing the story), and while it's not a free add-on, at least the developers thought to give those who wish to purchase it the ability to experience their game without restraint. I had hoped the addition of this DLC would come with the alleviation of some of the distracting and frustrating bugs, but it looks like those are here to stay. Still, with an entire county now at your disposal to explore and play with entirely as you wish and no metaphorical clock to slow you down, State of Decay is more inviting now than it was when it originally launched. If you enjoyed your time in Undead Labs' playground, you can't pass Breakdown by.